Shop our online store for JEEP WRANGLER keyless entry remotes and key fobs at excellent prices! 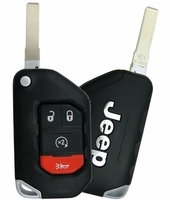 Up to 75% off dealer costs on Jeep Wrangler key fobs. Original Wrangler keyless remotes with and without auto engine start feature. Purchase replacement Jeep Wrangler key fobs from us and save. Remote control covers and transmitters - discount prices. The Jeep Wrangler Keyless Entry is one of the reasons why people are so excited about this vehicle. The Jeep Wranglers have been around for a long time. These vehicles have always been known to be rugged for the all terrain and regular roads. The fact that this vehicle has the Jeep Wrangler Keyless Entry device proves that Jeep is concerned about another feature: safety. The list of Jeep Wrangler accessories is long, but none are better for safety than the keyless entry. There is nothing worse than having to ramble in the dark for a set of keys at night. Anything can happen during those seconds where people are trying to search their pockets or ramble through their purses for keys. The shape of the keyless entry device makes it hard to lose even if it's inside of your clothing. This device also cuts down on all of the time that it would take to open the door in the dark. One click is all that you need. This device also has a panic button with an alarm to halt potential attackers. The Jeep Wranglers have been made safer with this simple device. People that lose their keys may be able to get a replacement online. These devices are lifesavers for drivers that forget to lock their door when they are home. Everyone doesn't want to go back out to verify whether they locked the doors to their vehicles. With the Jeep Wranglers accessories like the keyless entry device people do not have to roam back outside of their home in the middle of the night. They can simply pick this device and click the lock button. It has definitely become a convenient feature that will be greatly appreciated by the people that have access to these devices. It is difficult to go back to anything less than this once you have access to a device that simplifies life in so many ways. This is just one of many innovations connected to the Jeep Wrangler brand. This feature has actually been around since 2001 and it continued to be something that Jeep proudly stood behind. The company knows that they cannot physically protect drivers that are outside of their vehicles, but the company can make the walk back to the vehicle much safer. This is what the company has done. This makes it hard to be a compete like Jeep. This company has given consumers the Wrangler.